Cinder Roxley continues with her promise to maintain and improve the Radegast lightweight client for Second Life and OpenSim, and on July 15th she released version 2.24, which sees a range of improvements, both visible and under-the-hood. Triggering gestures directly from nearby chat, just as you would from any viewer (e.g. by whatever trigger is set for the gesture – such as “/hey”). The wearing of multiple system layers (multiple pants, shirt, jacket, tattoo, layers), again as has been the case with the viewer for the last several years. An audible “pop” sound when blue notifications open, to assist the visually impaired when notifications are received. Under the hood are even more changes, with Cinder continuing to refactor and improve the code – notable focusing on the plug-ins manager, and a new tarball for Linux installation. In the case of the latter, Cinder notes you need to have a recent (4.6.x or later) version of mono installed, together with the latest patch set. The tarball could potentially be used with Mac OSX, although Cinder also states, “it will run if you put a lot of effort into configuring Mono and Xquartz to properly handle WinForms … but WinForms is poorly supported on MacOS.” She goes on to say she’s still working on getting the client more readily installable on Mac OSX. The Linux installation has not be thoroughly tested, so if you are a Linux user and would like to help Cinder, please download and install 2.24, and record any issues you encounter on the new Radegast issue tracker. If you are a coder / developer, and would like to assist in maintaining Radegast, please contact Cinder Roxley. Radegast, the third-party Second Life / OpenSim client which has proven to be especially popular with those on low-end systems and / or those with visual impairments, now has a new home, and recently underwent a new update. As I’ve missed the last couple of cycles with this client, the following is intended to be a quick overview of its status and a brief look at the updates which have been made since my last review. Radegast now has a new web presence, where details of updates are blogged, and which will see things like the wiki and user guide move across to it in due course. As there is no means to access the “old” Radegast site, this remains available for legacy purposes. The client itself, as I noted towards the end of 2016, is now being maintained by Cinder Roxley, who would welcome any support that can be offered in helping to maintain and develop Radegast and the website.Those interested in doing so code-wise, can find the source code, build instructions, and examples at https://bitbucket.org/cinderblocks/radegast. There have been two updates to Radegast since my last review of the client (which essentially laid-out the updates Cinder had made to restore Voice capabilities reliably after Beq Janus provided a workaround for issues being experienced as a result of Radegast no longer being maintained as a result of Latif Khalifa’s sad passing). An important note to remember with Radegast is that while it has a 3D scene rendering capability, allowing you to see the world around you, it is very experimental, therefore, the degree of success you may get with rendering things might be variable. In testing the client, I found Radegast had a hard time trying to render rigged mesh body parts, making it impossible to visually confirm the Bento support. However you mileage may vary. Certainly, the fact that the 3D scene renderer is experimental and may hiccup shouldn’t put those who need / prefer Radegast off (I sincerely doubt it ever would). The bottom line is that with or without the rendering capability, Radegast is a superb lightweight client, and both the 2.21 and 2.22 updates are ensuring it keeps abreast of updates to the “full” viewer, and remains a useful tool for those who rely on it. with thanks to John Brianna for the note on the new Radegest website. Thanks to an article by Beq Janus and news passed to me by Whirly Fizzle, this blog was recently able to cover the issues of Voice installation failures in the Radegast lightweight client, and the work put into rectifying the problems. In short, it was discovered that Radegast would no longer install the SL Voice package due to the location the installer was pointing to being a) not provided by Linden Lab; b) no longer valid. Shortly after this was discovered, Beq found a temporary workaround to get things going using the Radegast version of the SL Voice package, and Whirly found a means to manually get Radegast to work with the current SL Voice package from Linden Lab. In response to a plea from Beq for developers to consider helping to provide a more robust solution, Cinder Roxley stepped in, and in short order had Radegast’s installer updated to work with the current SL Voice package. Cinder has now confirmed she hopes to continue maintaining working on Radegast. Given that the current website for Radegast can no longer be accessed for updates, Cinder is working on a new site as well, although as she notes, bringing everything together will take time and energy. There’s no immediate time line for a further Radegast update, but knowing the work is continuing is likely to come as good news to a lot of people – and if other developers are interested in helping out, please contact Cinder in-world. In the meantime, thanks to Cinder for taking up the challenge. Update, November 30th: Cinder Roxley has updated the Radegast installer to work with the most recent SLVoice package. See her comments here and here (following this article). 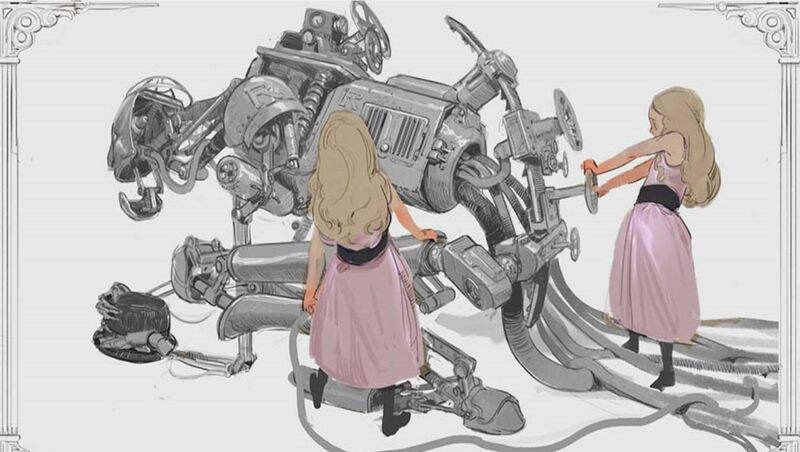 There is also a separate blog post on her work, for easier future linking. It was recently discovered that the Radegast client was no longer installing the SLVoice extensions with a new / clean installation. On hearing of the problem, Beq Janus and Whirly Fizzle decided to investigate, and thanks to their work, we now two workaround solutions. As they had put the effort into sorting things out, I asked them if either would like to write about the issue and the solution, and Beq, with Whirly’s blessing, agreed to do so. A few days ago when I was invited to reprise my role as a videographer for a special episode of Designing Worlds on the Future of Second Life, which will air in early December. The panel for the discussion included Gentle Heron of Virtual Ability Inc, the group who work to enable access to virtual worlds for those who, through disability or illness are unable to make ready use of regular viewers. During the show, Gentle urged Linden Lab and us all to look for ways to make Virtual Worlds more accessible, remarking, somewhat fatefully, that many of her communities are limited to a single, troubled viewer, Radegast. A subject of reviews in this blog, Radegast is a lightweight, extensible client which has been the ideal foundation for the disabled communities to build upon. It boasts an impressive set of speech to text and text to speech integrations and can be integrated with other devices such as braille screen readers. Sadly, Latif Kalifa, Radegast’s creator, passed away earlier this year and despite the code being open source, no-one has yet stepped forward to maintain it at a time when the Lab viewer is moving ahead in leaps and bounds, with the risk that non-maintained viewers and client might lose functionality. As if to underline this, Gentle fell silent towards the end of the show, as she was dealing with a number of users who were reporting they were unable to use Voice with Radegast as it was failing to install the all important SLVoice extensions. While I am unfamiliar with Radegast, I offered to try looking into it for Gentle. 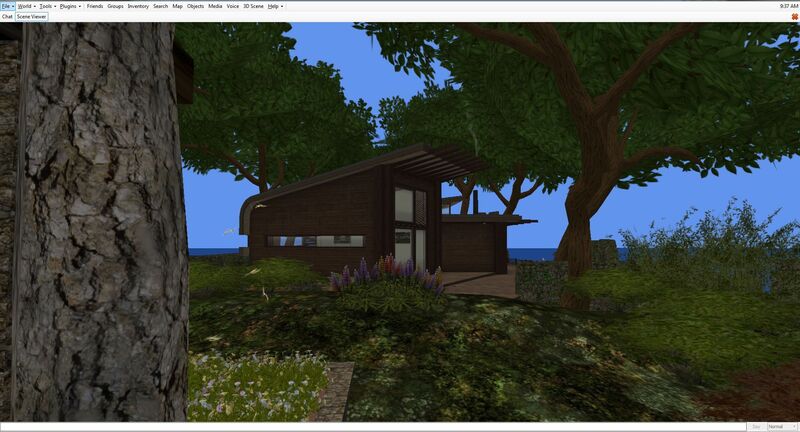 SLVoice is a pre-built binary package supplied by Vivox and distributed by Linden Lab. During the summer, it had been upgraded to address some security concerns and so it seemed likely to me that Gentle’s problem might be that the older SLVoice package had been deprecated and removed from the download server. Sure enough, a quick check on the package URL resulted in the dreaded 404 not found error. I sent an email to Oz and Patch Linden asking them to confirm whether older versions of SLVoice had been moved. The next day Oz confirmed that all old SLVoice packages were still available and nothing had changed. Whirly Fizzle, the powerhouse behind Firestorm QA, leapt into action: she cracked open the installer and discovered the URL actually pointed to a separately hosted Voice package which was no longer available, causing the Voice installation to silently fail during a new or clean Radegast installation as a result. However, Whirly also found a working back-up archive we could perhaps use. Unfortunately, neither Whirly or I are C# coders and cannot update the installation package directly; so how could we get a Radegast installation to work with the back-up Voice package? I hit on the idea of first installing the backup package that Whirly had discovered, and then running the standard Radegast installer. Success! So, for anyone who is performing a clean / new install of Radegast and needs Voice, I’ve produced a set of instructions – see the link below. There is, however, more. I mentioned above that Linden Lab had updated the SLVoice packages over the summer to deal with security concerns. Because of this, older versions of SLVoice are to be blocked from connecting to the service, and Radegast would once again be without a Voice option. Knowing this, and never one to leave a job half done, Whirly successfully tested my approach using the most recent SLVoice package available from the Lab, and confirmed it will also work. This means that providing that there is no internal dependency within Radegast on the legacy Voice package, we now have an upgrade path for Radegast users that will ensure continued voice support after the block on older SLVoice packages comes into force. To help ensure people know what they need to do, Whirly’s instructions can also be found in the link below. These instructions are only a workaround. We still need to find a way to have Radegast install the correct Voice extensions automatically, as a part of the client install process. So, if you are a C# (C-Sharp) developer and are willing to spare a few hours looking at this, please take a look at the Radegast codebase and see if there is a way to incorporate the correct binaries into an installer package. Thank you. With grateful thanks to Whirly Fizzle. Radegast is a third-party Second Life / OpenSim client which has proven to be especially popular with those on low-end systems over the years, and gained a solid level of support from the visually impaired, who found the client a lot easier to use than a full viewer – so much so that a special accessibility guide was produced, and special classes held in using the client. Sadly, ongoing health issues impacting Latif Khalifa, Radegast’s creator, reached a point where, in November 2014, he had to signal that he was unable to continue maintaining the client, although he ensured the source code remained available for anyone who wanted to do so on behalf of the community. Well, the good news is that on Thursday, July 9th, Radegast was updated to version 2.18. The even better news is that the person making the update was – Latif Khalifa! Add log-in support for SirinHGpole-Grid to the grid manager (RAD-503). Group Ban capabilities can be be awarded to any role in the group by enabling the GroupBanAccess option in the Allowed Abilities section of the Roles sub-tab. 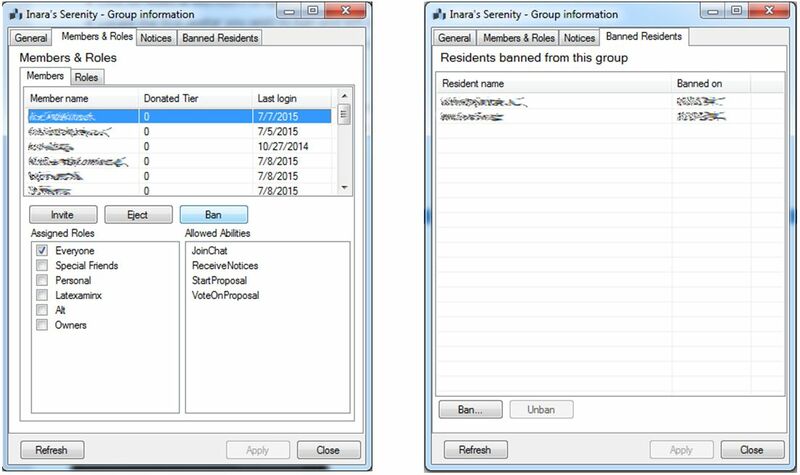 The Radegast 2.18 update adds Group Bans to the client use the Ban button in the Members and Roles list to eject and ban a person in the group; use the Banned Residents tab to track those previously banned or to pro-actively ban users from joining the group. For those unfamiliar with Radegast, it is a full feature but lightweight client able to run on Windows, Linux and Mac OS. It provides pretty much all of the capabilities found in a full viewer, including full inventory management, mesh upload capabilities, voice support, etc.. In addition, it has a few options of its own such as an API for plug-ins, speech recognition and an AI capability (ALICE). For those who may be without their viewer for some reason, but would prefer to see what is going on in-world, the Windows and Linux versions of Radegast provide a 3D scene renderer in which you can see the world and move around in it, chat with others and – via the Objects option – interact with the things you see around you. Radegast’s in-world view option (the Scene Viewer) – note this does not support windlight, etc. All of this has made Radegast a flexible, usable and popular client, and if you’d like to know more about it, please refer to my Radegast coverage in this blog. Given Latif is still recovering from illness, this update may not signal his full return to supporting Radegast; when I did ask him about this update, he replied, “there were several updates, such as group bans that were done, but unreleased. So why not get them out ;-).” As to the future, we’ll have to see what comes along; but certainly, seeing Latif back in the saddle with this release is great.